A successful company is never satisfied with the status quo. Good business owners and managers are always looking for ways to improve efficiency, reduce costs, and increase profitability. Every part of the business has to be working as intended and this includes equipment like the printer fleet. An inefficient print fleet can be a headache for employees and a major cause of inefficiency. These inefficiencies can cost businesses money and eat away at the valuable time their employees could be making a difference for customers. In today’s modern business world, there is simply no room for agile and forward thinking businesses to tolerate this kind of bottleneck. That’s where managed print services and a professional print fleet assessment come in. Identifying problems and providing tailored solutions are the ultimate goal of every office print assessment. At the end of the day, every company has to earn revenue and turn a profit to continue operating. This is the most basic aspect of doing business. If expenses like printer management and supplies are eating up a disproportionate piece of the budget then, quite simply, that printer fleet is not working for the business. A print fleet assessment looks beyond just the devices being utilized and pinpoints the biggest areas of concern for individual businesses. This professional print assessment includes monitoring usage by individual users, the layout or deployment of devices, the workflow of employees, and more. With all of this data, recommendations can be made that will ultimately help to reduce costs. Providing solutions that reduce the need for printing, deploying devices to areas where they are most needed, and optimizing device selection are just a few areas where an office print assessment can help make a difference. Since paper waste makes up 50% of office waste, reducing that waste can be a big boost to the bottom line. A print fleet assessment and managed print services can help make every employee in the office more efficient. With digital workflow management, some employees may be able to reduce their printing and streamline their workflow with digital solutions that allow for faster sharing and better collaboration. IT staff will be able to spend their time more effectively by focusing on other issues in the office rather than assessing and monitoring print usage themselves. These solutions can extend far beyond the walls of the office too. For example, 77% of adults now use smartphones and many of them use smartphones for work. With managed print services, mobile staff can have instant access to the documents they need without stopping by the office just to pick something up. This allows them to use their time more effectively, get face to face with more clients, and build strong relationships rather than use their time for administrative tasks. 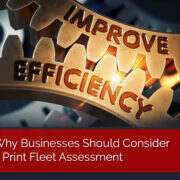 As mentioned above, a print fleet assessment does more than simply analyze devices. A professional assessment will take into consideration how staff work, how they complete tasks, and make recommendations on how to improve those workflows. This past year has put a microscope on data security with some big companies suffering damaging breaches that hurt their bottom lines as well as their reputations. Hackers are only becoming smarter which means that businesses have to stay one step ahead when it comes to securing data. However, printers often go overlooked when it comes to network security despite the important and confidential information that may pass through these devices. A print fleet assessment can identify areas of concern and provide data security recommendations. With many users now scanning and storing digital documents, this security is more important than ever. Plus, with managed print services, businesses can feel confident in the ongoing security of their devices and the important information they hold. Seeing tangible financial benefits as a result of an office print assessment is nice, but there are less tangible results which are still important. Today, may businesses and their customers are pursuing more environmentally friendly strategies. A major part of this strategy for any business should be to reduce print waste, look for digital workflow solutions, and focus on recycling waste whenever possible. As more and more people become aware of environmental concerns, businesses that are ahead of the curve will have a unique competitive advantage. Going green can help businesses save money today and position themselves for success in the future. Reducing costs, cutting back on waste, and enabling employees to do their best work are some of the most important ingredients for success in the business world. Putting all of those ingredients together takes the experience and professionalism that a managed print expert from Smile BPI can deliver. Smile Business Products specializes in print fleet assessments as well as managed print services. To learn more, please contact them today.